Let’s breathe in a sigh of relief: We have officially made it through the first family holiday of the season. From cooking flops and your grandmother asking when you’re going to get married, to your weird uncle falling asleep at the dinner table, it can seem like a true miracle that you even survived another holiday meal. Personally, the stress of it all can leave me yearning for my quiet home and a nice glass of something strong. Luckily, we have just what you need to wind down from the Turkey Day festivities, and to get you prepared for the next family gathering in a few weeks. Here are some wintry and holiday cocktails around Baton Rouge to get you to the other side of the holiday season. The upscale restaurant in Bocage Shopping Center is dishing out a couple of cocktails to keep you warm in the cold winter months. Beausoleil is offering homemade eggnog, an apple cider old fashioned, hot buttered rum and The Snowflake—a Cosmopolitan made with white cranberry juice. Stop by for one of the holiday treats, and stay for the truffle-fried oysters and smoked duck breast. The downtown restaurant is serving up a drink called Orion’s Belt during the holiday season. The flavorful cocktail is made of Braulio (an amaro liqueur), Crème de Cassis and Founders Breakfast Stout Beer. The name for the drink is drawn from the actual constellation, which is visible in northern latitudes from November to February. If you like your drinks brewed rather than shaken and stirred, The Radio Bar has just the drink to sip on over the holiday season. The Mid City bar is serving Shiner Holiday Cheer, a dunkelweizen (a type of German wheat beer) brewed with roasted pecans and peaches. The new-ish downtown spot is serving up a cocktail called The Apple Addiction. 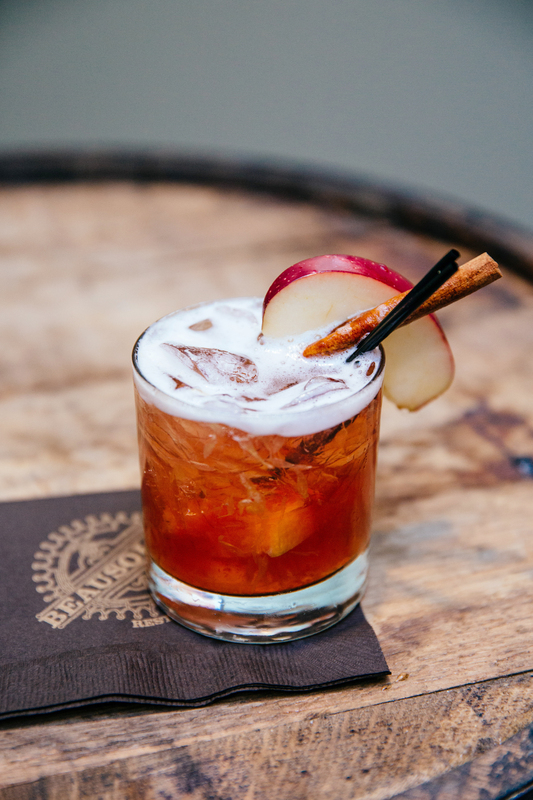 Made with vodka, apple juice, cinnamon simple syrup, and cider, this drink reaches a whole new level of winter goodness. The Caribbean restaurant is working to keep our bellies warm this winter with hot buttered rum available all winter. Keeping true to the restaurant’s name, the rum drink is sure to pair nicely with cold weather and hot queso. Bring on the spice! Tin Roof has come up with the Manchado, a Mexican coffee-style stout. Inspired by an ancient Aztec drink by the name of Chocolatl, the beer gets its unique flavor from the addition of cinnamon, orange peel, chocolate and coffee malt. Try it out on a cold day for a warm and pleasant experience. Forget the margaritas for a while and enjoy a Pumpkin Spiced Cocktail from The Velvet Cactus. Made with Patron XO Café, Rumchata, half and half and a couple secret ingredients, this smooth and creamy drink is sure to get you in the holiday spirit. Willie’s is serving up one of our favorite duos—coffee and booze. The restaurant offers the Tipsy Joe, made with cold-brew coffee, caramel and Kahlua. Even better, the restaurant actually offers this year-round, so you can enjoy the drink now and get it later, too.